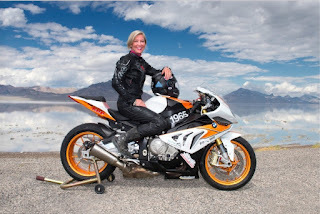 Twelve-time land speed record holder Erin Sills piloted Hunter Sills Racing's BMW S1000 RR to 219.3MPH from a standing start on the Mojave Magnum 1.5 mile distance and to 210.1MPH over the Mojave Mile distance. This builds on the team's previous success leveraging the S1000 RR platform, having set five world and national records at their last Bonneville land speed racing event and setting a Guinness World Record Book record for two people simultaneously on a motorcycle at 181.426MPH. Gary Orr, owner of San Diego BMW Motorcycles said, "After our success on salt at the Bonneville Motorcycle Speed Trials, we were looking forward to seeing how our bike would perform at the Mojave Mile standing-start event. We couldn't be happier with the results, particularly given the bike is prepared to SCTA production regulations, and we are very excited for the rest of the 2016 race season." Added Sills, "The S1000 RR is an incredibly confidence-inspiring machine, performing extremely well on the race surface of the Mojave standing mile event. Despite considerable gusting side winds for a number of race passes, the BMW felt very planted throughout the weekend, allowing us to get full power to the ground and accomplish such an incredible top speed." Hunter Sills Racing will take their S1000 RR to "the dirt" next, racing the El Mirage land speed racing event on the El Mirage Dry Lake Bed on May 14 – 15, 2016.